At the end of the 19th century a 760mm narrow gauge railway was planned to connect Sibiu and Sighisoara. It was designed to create a link across Saxon Transylvania between the Târnave and Olt valleys. The construction work began in 1896 and ended in 1910. You can download a 1910 map of the route from here. It must be remembered that the railways pre-dated the combustion engine - and at this time in Transylvania the only option was horse-drawn transport. Consequently much of this railway was built directly through the centre of towns and villages. 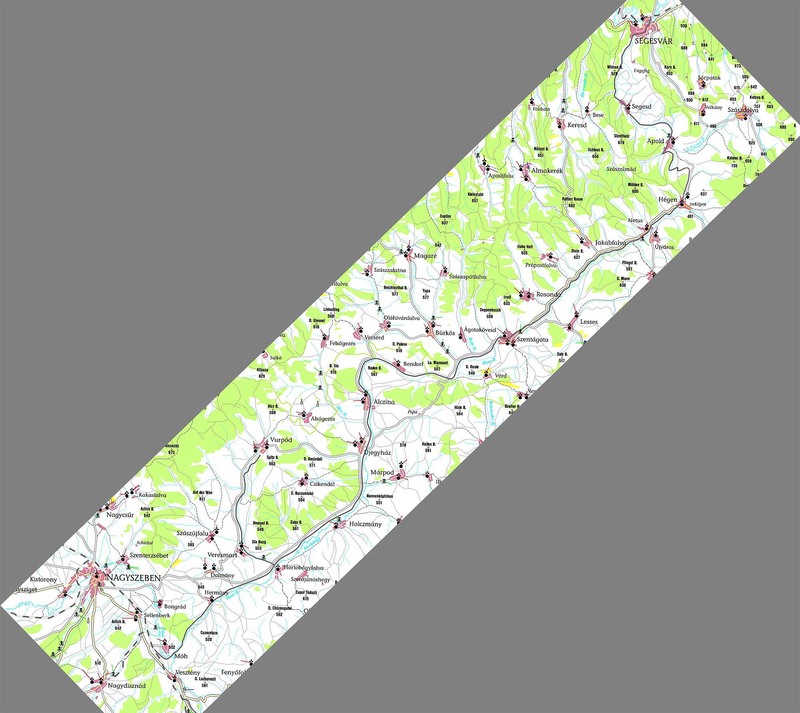 If you open the above map link, you will see that the railway predates the road between Apold and Segesvár (Sighisoara). You must also remember that at this time Transylvania was part of Hungary, so many of the towns and villages had Hungarian names - for example Segesvár is the Hungarian, and Sighisoara the Romanian. But in this region there are also many Saxon German communities, who are decendents of people who arrived here in the Middle Ages. Consequently, the German language is still spoken here today. Agnita with 12,119 inhabitants is the biggest town of the area, after Sibiu (170,000) and Sighisoara (30,000). Not including Sibiu, a total of 54,673 inhabitants were served by this railway. It provided transportation for the resources extracted in the area - especially wood - as well as for the local rural economy. Forty villages and small towns were linked by this railway. Extremely reminiscent of the American Wild West, this shows a trestle bridge probably crossing the River Saes on the edge of Sighisoara. 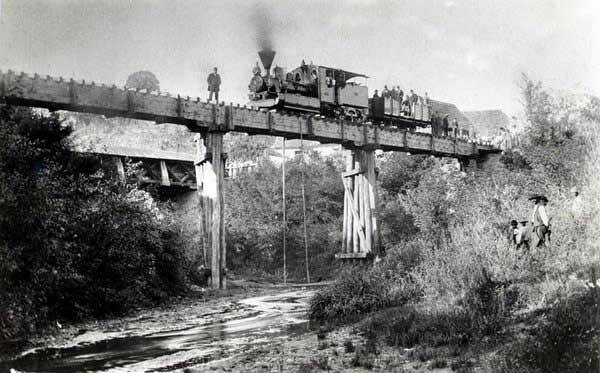 The locomotive on the bridge is named 'Apor' - after a Transylvanian baron . The first three locomotives came from the Austrian company Wiener Neustadt. These were in the 0-6-0 configuration with 2-axle tenders and were numbered 388.001-003. They were given the hungarian names 'Apor', 'Szentágota', and 'Segesvár'. These historic locomotives survived until the 1960s when 388.002 was plinthed in Sighisoara and then finally moved to the Sibiu railway museum where it survives today. These were followed by the 389 series, in a similar configuration. A section of rail from the Sibiu-Sighisoara railway produced by the Royal Hungarian State Iron and Steel Works at Diosgyor in 1910. An interesting feature of this railway is that several kilmetres of the western Sibiu end involve dual-gauge running - seemingly to economise on trackwork. East of Sibiu, two separate reversibly-signalled standard-gauge main line tracks run from Sibiu via Atelia Zona and Selimbar stations to the junction of the Cisnadie branch, a distance of about 6km. On this section the southern track has two three-rail dual-gauge (760mm and 1435mm) sections. From Atelier Zona to Selimbar the two main tracks are separated by an old carriage and wagon works. Through the area of Selimbar CFR Station, the 760mm-gauge runs separately alongside the standard tracks and behind the back of Selimbar CFR Station, but from Selimbar to the junction for the Cisnadie branch two tracks run alongside each other with no intermediate halts, and the southern one is again dual-gauge. From the Sibiu to Cisnadie junction, the standard-gauge branch heads south, leaving the narrow-gauge running parallel to, and south-west of, the Sibiu to Brasov main line, past Mohu CFR Station. The narrow-gauge Sibiu - Mohu - Cornatel - Agnita (and originally Sighisoara) line used to cross the standard-gauge on the level on the Sibiu side of Mohu. For this reason Mohu station building is set back from the main line where the narrow-gauge formerly ran through the gap. Today the old narrow-gauge railway dives under the main line to head north-east up the Hartibaciu Valley to the Agnita terminus. The line was used along the entire distance, from Sighisoara to Sibiu (108 km), until 1965, when the section between Sighisoara and Agnita was closed down. Between May 1997 and final closure of the remaining line in 2001, one passenger/mixed round-trip ran daily (CFR 204) and timber traffic was loaded to rail waggons in Agnita yard for the trip to Sibiu Yard. The Cornatel to Vurpar branchline closed in 1993. Since the gradual closure of the narrow-gauge railway the region has suffered pronounced economic decline. Although there is very little trace of the Agnita to Sighisora end of the line, the trackwork of the remainder is still in reasonable condition - but much of it overgrown with vegetation. Recently there has been great interest in restoring as much of the railway as possible, to bring it back into everyday use for the many local communities who live along the route of the line, and also for tourism development in the region. This website is a product of that initiative. Mircea Suteu used to work for the Brasov Regional Railway Company, he wrote the following description of the Sibiu to Sighisoara Railway. We don't think there are many readers who know about the Hartibaciu river, which flows into the River Cibin from the Tarnavelor Plateau. A narrow-gauge railway runs along the river valley, from Sibiu to Agnita, and for many years it used to run all the way to Sighisoara. I will take you on a journey on this very picturesque railway. The first 58km go through the Cibinului valley. As far as Mohu station the track runs in parallel with the regular-gauge main line which goes to Brasov. Leaving Cibin, the railway follows the path of a mountain stream called Hartibaciu, which has its source in the southern part of the Tarnavelor Plateau, a few kilometres away from Apold. The origins of the railway began in the 19th century, when two private companies were hired by local officials to build a railway to connect Sibiu and Sighisoara - two cities with medieval roots - to provide transportation for the resources extracted from the area (agricultural and mineral), as well as for the locals, who until that time could only travel along roads which were often unusable. Building the railway - on narrow track because of the landscape and costs - would begin from both ends, Sibiu and Sighisoara, and meet in Agnita, the main economic centre of the area, which specialised in processing animal hides. Construction work on the Sibiu-Agnita end began first in 1896 and was completed in September 1910, including the branch to Vurpar (13 km). Then the line was finally extended to connect Sibiu with Sighisoara (109 km). The landscape of the railway is magical, with abundant vegetation. But the train always remains close to the turbulent Hartibaciu river. After Cornatel station the railway branches off to Vurpar. On the last 20 km towards Agnita, the train passes directly through the villages of Hosman, Tichindeal, Nocrich, Altina and Benesti. Until the 1970s the narrow-gauge trains were steam-hauled. This allowed passengers to experience the joys of those who travelled the line at the beginning of the century. Initially, locomotives were the 389.000 and 388.000 series (Austrian made). After 1923 the trains were hauled by the 764.100 series (German made), and since 1955 with Romanian-made 764.200 series locomotives. From 1970, traction moved to L45H diesel locomotives. The steam engines were only used during the cold season to generate heat for the carriages, or occasionally to haul vintage trains filled with travellers who were keen to re-live a piece of railway history. The carriages are small, but nevertheless comfortable and clean. They eat up the kilometres at the dizzy speed of 20 km/h. Passengers "feel" all the joints in the track as they travel along. There are shepherds and peasants, townspeople, workers and clerks. They make use of the two trains which connect Sibiu to Agnita - departing from Sibiu at 8.05am in the morning, and from Agnita at 15.20pm. The journey takes two hours and 40 minutes. The line remained in operation from Sighisoara to Sibiu until June 1st 1965, when the section between Sighisoara and Agnita was decommissioned. The final section of the Sibiu to Agnita Railway was closed in 2001. Read about the proposed restoration here.